Free-Dot project is a space in which musical and cultural boundaries are broken, and opportunities of artistic dialogue are wide open. It aims at exploring sound and its resonating relationship with silence, creating sonic landscapes and tone colours sparked by the meeting of musical instruments of diverse cultural background. Point of departure are those from India and Iran, in particular traditional percussion and frame drums played by Paolo Pacciolla who is also a keen researcher and scholar of their history, their making and performing techniques. Other strong influences are Africa, and of course western classical and jazz traditions, utilizing woodwind instruments with an evocative and harmonically rich tonal palette such as flute family and the alto flute in particular, played by the sensitive and accomplished Antonio Cotardo, whose unique sound and improvisational style is characterized by a personal blend of jazz, classical and world influences. Improvisation as variation and development of compositional material is at the centre of Free-Dot, as well as the use of spontaneous layering of phrases and polyphonic textures. Ideally Free-Dot follows the way paved by all the musicians which have devoted their work and lives to breaking all human, cultural and artistic barriers, using music as a space for experimentation and creative encounter. Antonio Cotardo: flutist and tutor, got his diploma at the Conservatorio di musica ‘Tito Schipa’ of Lecce and attended the three-year course of high specialization at the Accademia Musicale Umbra taking the diploma. 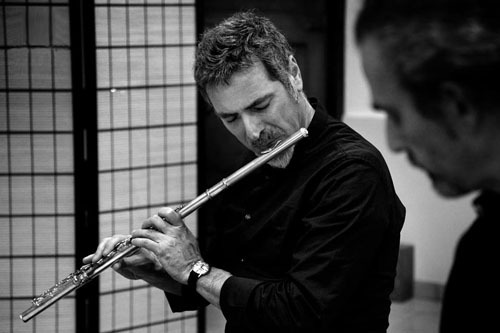 In 1997 starts studying jazz harmonics and improvisation techniques with the flutist Nicola Stilo. 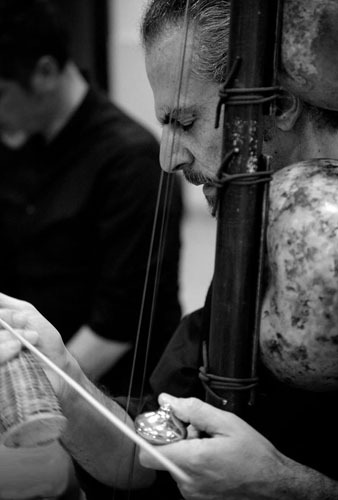 In 2000 starts an important collaboration with the group Ghetonia, participating at numerous festivals in Italy and abroad: Turin, New York, Boston, Frankfurt, Brighton, London e Greece. With the group he recorded the CD’s “ Krifi”, “ Terra e Sale” e “Riza”. In 2005 he founds Photinx Quartet for which he writes and arranges music. In march 2006 the Quartet recorded the CD Photinx and played at “ La Fondation Danoise” and “L’association la Mezzanine” in Paris. Paolo Pacciolla: pianist, percussionist and ethnomusicologist. Teaches ‘Ethnomusicology’ at the Corso di Musiche Extraeuropee of the Conservatorio di Musica of Vicenza. From 1995, soon after his degree in Pedagogy and diploma of Pianoforte, he spends long periods in India to study the classical Indian music and, in 1996, he receives a scholarship of the I.C.C.R. (Indian Council for Cultural Relations) to continue to study in New Delhi. He specializes in the pakhawaj, drum of the classical music of north India, in New Delhi, under the guide of Guru Ram Kishore Das. He deepens the study of the daire and the tombak, drums of the classical music of the Persia, developing a personal language. 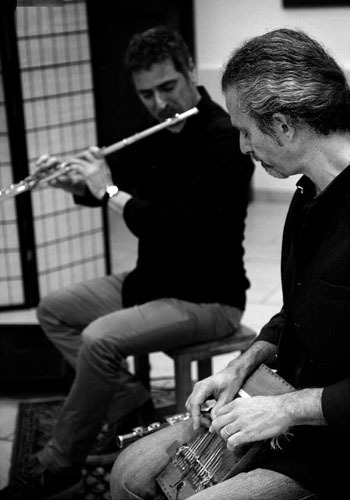 In 1999, with the Beppe Capozza Quartet, he recorded the CD “Round Circle” playing tombak, daire and pakhawaj. From 2003 to 2006, he taught ‘Indian and Persian Drumming’ within the three-year Course of Folk Music at the Conservatorio di Musica Tito Schipa di Lecce. 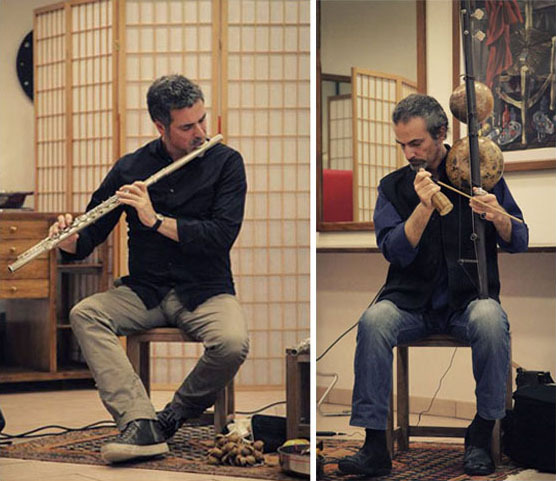 Member of the Italian Association for Sanskrit Studies at whose meetings presents lectures on Indian music and instruments, he is author of the monographs “Il pensare musicale indiano” (Besa, 2005) and, together with Luisa Spagna, of “La gioia e il potere. Musica e danza in India” (Besa, 2008). He wrote also various articles and essays on music published on specialized magazines. With the dancer Luisa Spagna, as Sutra Arti Performative, presents original productions and classical repertoire of India in festival in Italy and abroad.